For your trip to Cameron Highlands stay at the beautiful Iris House hotel located in Brinchang and in a close vicinity to Tanah Rata. When staying at the Irish House Hotel you will be right in the center of wonderful mountains and rolling hills. You will be surrounded by the beautiful paradise of all the beautiful greenery. This is a wonderful place for your family to stay during a nice family holiday because there are many wonderful tourist attractions near by. You will not find another hotel surrounded by more restaurants and shopping. There is a beautiful meeting room located at the top of the hotel that is light by beautiful natural light. Enjoy all the amenities the Iris House Hotel has to offer such as free wifi, plenty of warm water, beautiful balconies, hair dryer, a television, an elevator, and a security box. This hotel is within walking distance to the main street of Brinchang and the wonderful night market. Iris House Hotel is also located near the Cameron Highlands golf course so you can enjoy a fun day of golfing. This is definitely a hotel that you will find perfect for relaxing after a long day of exploring Cameron Highlands. 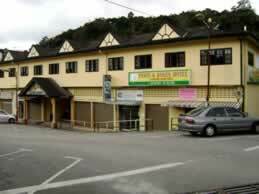 Iris House Hotel is strategically situated at Jalan Kuari in Brinchang area. Travelers to Cameron Highlands can access to the hotel via the Simpang Pulai or Tapah road. Besides that, drivers can also reach Iris via Gua Musang in Kelantan. This peaceful and tranquil hotel is surrounded by lush greenery tropical forest and other spectacular Tudor style architecture. Iris House Hotel offers numerous room types for guests’ convenience. Among some of the rooms available includes standard room, deluxe room and also family triple. The spacious attached balcony enables the visitors to overlook a picturesque 18-hole public golf field and also panoramic view of Brinchang town. Iris House Hotel is definitely the ultimate choice for those who aims to spend a weekend getaway from city’s hustle and bustle. Staying in Iris also offers guests another advantage is its close proximity to pasar malam or Brinchang night market and craft bazaar. In addition to that, Butterfly Farm, Tea Estate, Vegetable and Fruit Farm, Brinchang Hill, and also Wild Orchid Park is within walking distance from the hotel. Besides that, visitors can also visit the Cactus Valley and Sam Poh Temple which is approximatively 10 minutes walk from the hotel. Among some of the basic facilities provided are hair dryer, IDD Telephone system, coffee and tea making facilities, room and laundry service, courier service, ample parking space, as well as conference and seminar facilities. With its tranquil and serene environment, Iris is an ideal destination for seminars, conference, meetings and also conventions. The small and also medium-sized meeting rooms are fully equipped with modern audio visual equipment to facilitate the business travelers during the process of presentation. Understanding that Iris House Hotel receives quite a number of tourists from around the world, Iris accepts Visa or Master card. Besides that, the hotel also offers free Asian and international cuisines during breakfast for the guests. This Tudor style building is hard to miss once you reach the top of Brinchang hill. Hair Dryer,In-house Movies, Mini Bar, Room Service and Laundry Service.